The Battle of the Brandywine was a critical military encounter of the American Revolution. Lands within and leading to this battle, spanning both Chester and Delaware Counties, are considered a resource of national significance by Landscapes2. To plan for the historic resources within the battlefield, it is important to understand how the battle was staged. The Study included a technical report of findings and recommendations, which included identifying and mapping the extent of battlefield for the first time and recommending completion of a battlefield preservation plan. This mapped battlefield extent from this study is currently the national American Battlefield Protection Program accepted battlefield bounds and the recommendations preservation plan was completed in 2013. 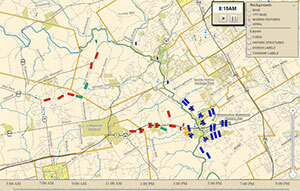 As part of a holistic exhibit space renovation including installation of a 1777 Philadelphia Campaign permanent exhibit, Chester County Historical Society retained Sean Moir, former 2010 Study Project Manager and current President of Western Heritage Mapping, to update the 2010 Animated Map based on refined findings in CCPC's Strategic Landscapes Plans project. The Strategic Landscapes Plans are geared toward collaborative local planning and implementation efforts and updating the animated map is one of the plan recommendations. This provides an excellent example of a local battlefield partnership implementation effort. View the updated animated map.